My life living in the largest favela in Rio de Janeiro. I want to help educate people about the realities of life here. There is much misinformation about favelas and we who live here. 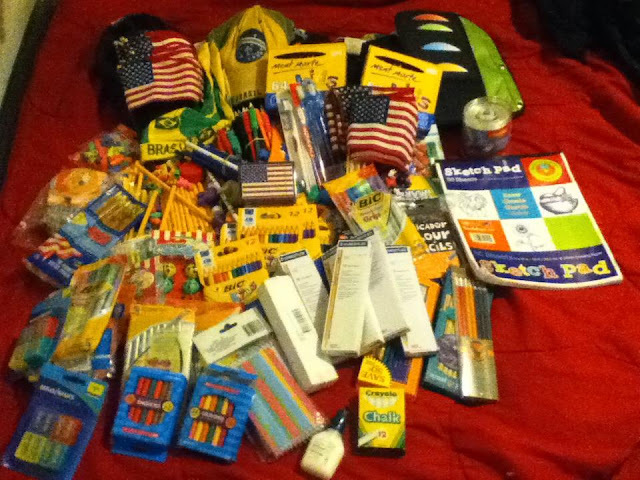 Donations through individuals or Pack for a Purpose is a big part of our work. There will always be people who are critical of others they don't know. 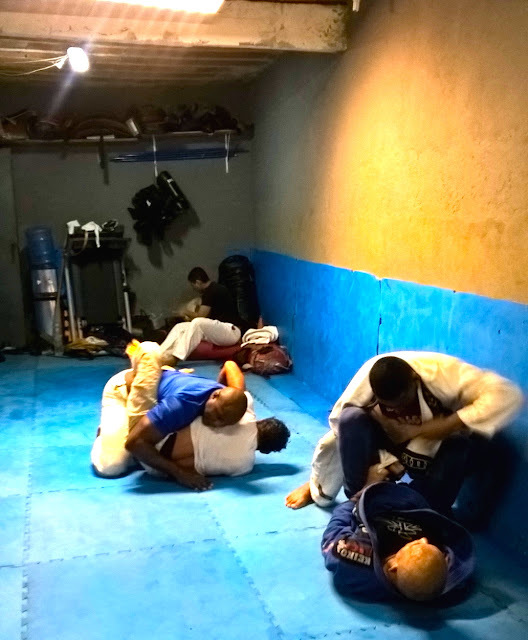 I have been involved in community activities here in Rocinha for about 11 years. My belief has always been, that in my work, there needs to be the service or voluntary aspect. I have no problems showing the work I do. I understand there are ethical questions that people may ask about how can tourism help a community like Rocinha. I am not the only one confronted with this legitimate question. Anyone that works in this community deals with the question, "How can tourism here benefit the favela"? Read this blog post for more details. I have always had this idea of tourism where everyone benefits a little, like sharing the wealth. I started the tourism initiative in 2007 out of a request of many here who thought I would be a good representative of this community. It was not easy at first to do this kind of work with those people who thought that this was exploitation. It is understandable, I get it. This was a chart I wrote showing guests how we work here in Rocinha. I started doing this kind of work for 3 reasons. I got tired of people outside of Rocinha always asking me, "How can you live there?" or "Isn't it an ugly and dangerous place?" The second reason was because I would hear guides who are not from here tell lies about the community. This does a great disservice to this place. It's bad enough with the media, but now outsiders repeating this same stuff? And on top of it, these outsiders making money off of the favela with their negative attitudes and not contributing any money back into the community. The last was, I thought that this place needed accurate representation, not only by me but by others involved in this kind of work. There are many guides and community activists working to bring visibility to favelas like Rocinha. A woman once said to me, "You know Ze, I like the work you do because you give us (the favela) value." Powerful words that I felt I need to fill big shoes of expectations. With tourism can open up other opportunities. The first was donations. People started asking me about donations and how they could help. In the beginning back in 2007, I would collect donations for Tio Lino's Art school "Rocinha Mundo da Arte". During my tours, I would bring people by his school and they could donate directly to his project. I remember when Freddy Gomes from Holland contacted me a years ago and wanted to donate to Tio's school. He came and he brought a suitcase full of supplies for the kids. Tio passed away a few years ago but he was someone I looked up to in his more than 30 years of voluntary work with kids, after working as a life guard on Sao Conrado Beach. He had a heart of gold and I still miss him to this day. He left me with lasting impressions about service to others and I learned a lot from him. After Tio's school starting receiving outside support and they reconstructed his building through fundraising, I stepped aside to find other projects to help. I moved on to buying and receiving donations of school supplies. We have many independent study groups called "Reforca Escolar", and I started donating to those projects. Many kids need, pens, paper, notebooks etc. for school. In 2011 I finally opened my dream project which is "Spin Rocinha" Dj school. After being a dj for over 16 years, this was the ideal project for me. I focused more on that because the buying of Dj equipment was very expensive. I still would sometimes receive school supplies and would distribute them to the contacts I had here. With the Dj School, I spent over 50,000 reais over a period of 4 years to complete the Dj school. 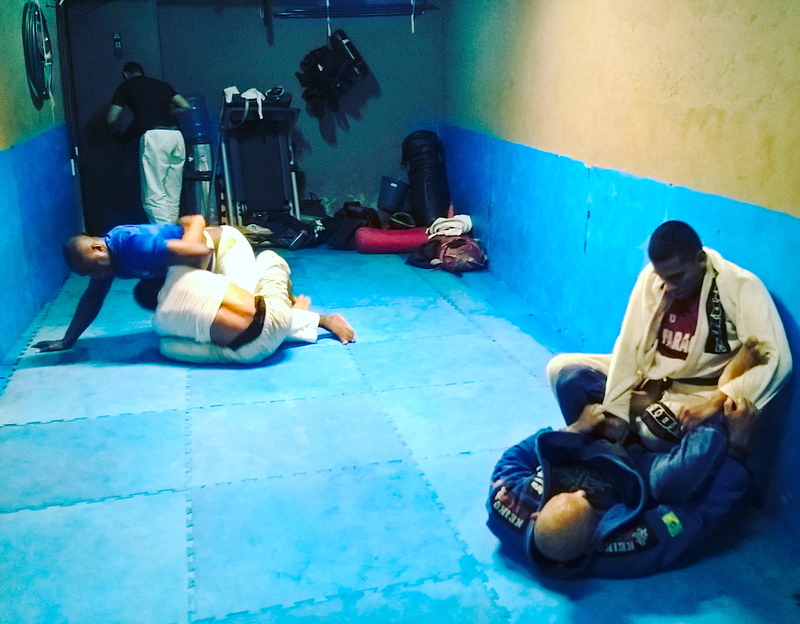 After working with Spin Rocinha, we started to get a lot media attention about the project, people would contact me about wanting to give workshops to our students. The Dj school is still running but with a different format due to the transient nature of life in the favela. Students come and go depending on school, work or they move away. Our classes are now active on the weekends so I can manage the other projects that I am involved with. 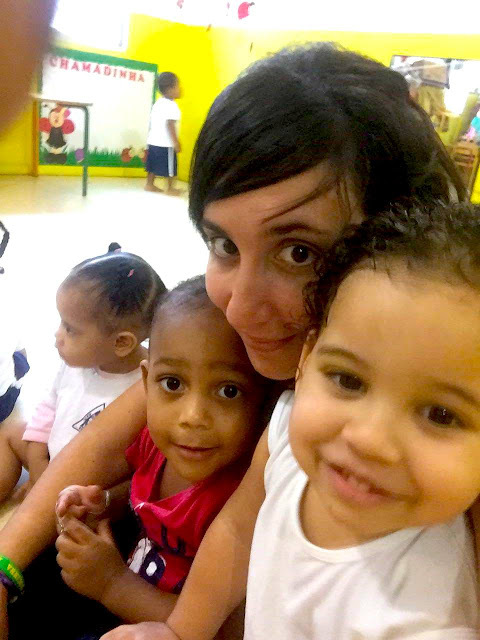 In 2014, I met Luciana who owns and runs a daycare out of her house. We started supporting her with buying school supplies, food and diapers for the babies. 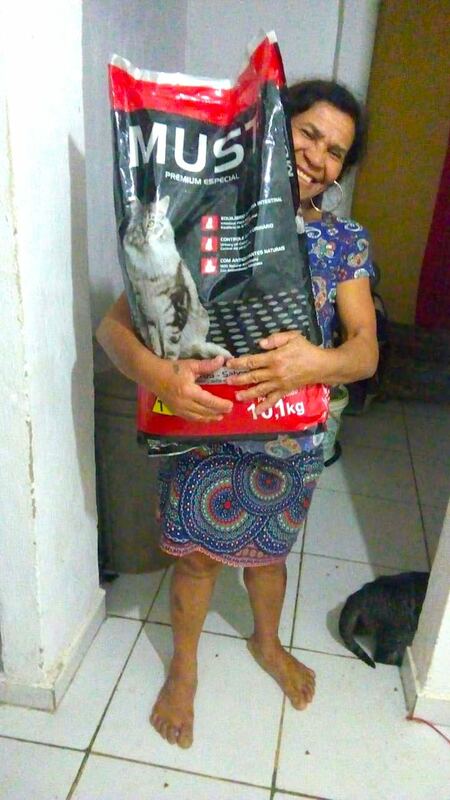 Berit has been a donor of clothing, toys and art supplies when she visits Rio. She donates 5-7 suitcases of much needed supplies to many projects in Rocinha. 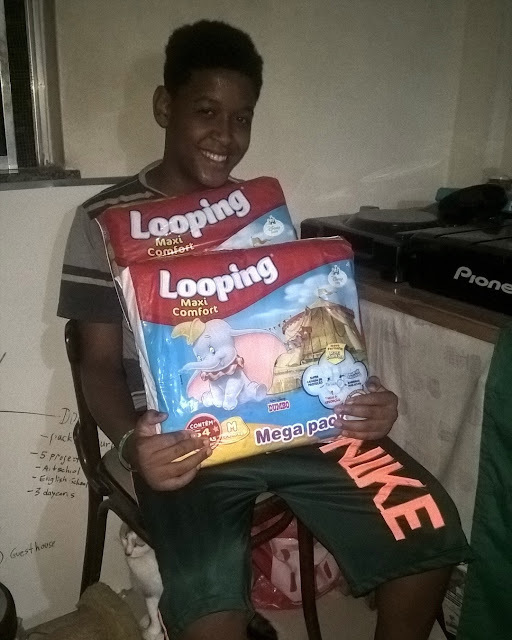 Igor, one of Luciana's sons holding diapers that were donated to her project. He came to pick them up at our Dj School. Last year I met with a woman (Ruth), who I have known for a while in seeing her almost everyday. She mentioned back in 2016 that she had many animals and needed help. I wanted to see how I could contribute. She would contact me about once a month in need of food for her animals. So, I would buy her cat or dog food. On my tours I would talk about her project and then people began donating money for the purchase of food. I would contact her, we would meet at the Rocinha Pet Shop and I would buy the food for her. 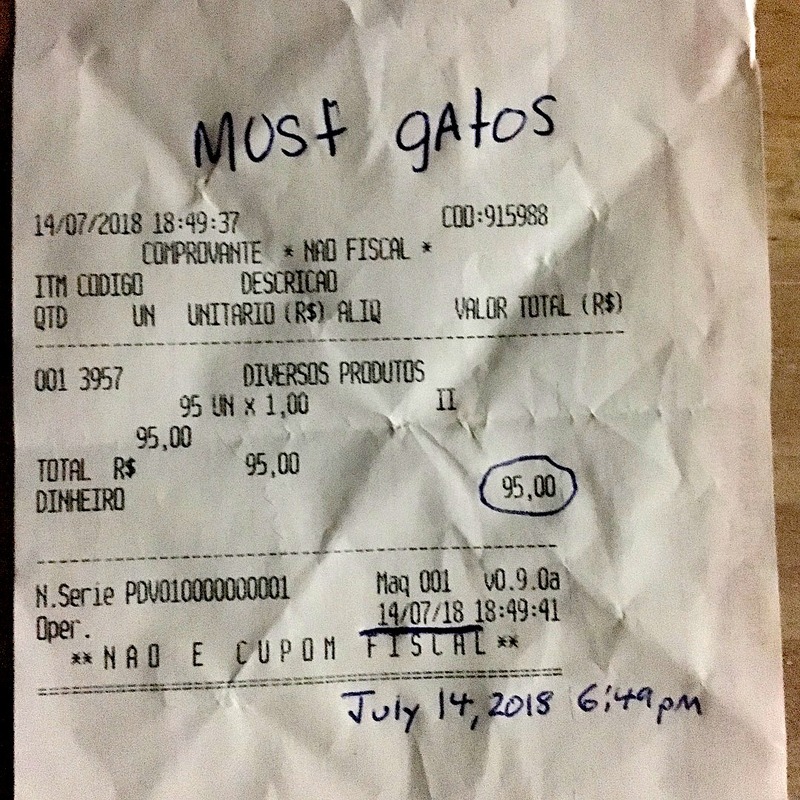 I would take a photo of her with the food and the receipt showing the date of purchase and I would email it to the person who donated. She understands why I do this and she is benefitting from the promotion of her animal shelter which she started construction in mid 2017. The more people can see her need, the more potential to receive help. We also were able to get another person to help her. Charmaine in Copacabana helps buy food too when she can. From the outside the Animal Shelter is simple but serves its purpose to house 60 cats and 8 dogs that Ruth cares for by feeding, castrating and making sure the animals get vet treatment and vaccinations. The only way to build trust and attract more donors is to show through your actions...what you say, is what you do. The next thing was that people who came to visit Rocinha would ask me how they could help the community. I gave them some ideas and referred them to honest organizations here that I trust. Eventually people would ask me about volunteering. I told them that I am NOT a volunteer type agency. What I can do is connect them to projects that they have interest in. So, for a while I did this as well, just connecting people, but not much else. I started to get more interest in people wanting not only to volunteer but to also stay in the community with a family or rent a place. When it got to the point where I felt there was a big time investment, I started thinking about this like a job. With people not from Brazil and who don't speak Portuguese, it can be a lot of work. They have many questions, especially when it comes to staying or working in a favela. You can't just have a foreigner come here and expect them to automatically know their way around or know how things work here. From the first email, it's about finding out what people not only want to do, but what they can do. A volunteer should come here with a plan and for example, if they want to teach English, they should have some experience with this. I also advise that they should at least learn some basic Portuguese if they are going to stay in the community. If you can speak some of the language, your experience will be that much more enriching for you. There has always been this question of should a person "pay" to be a volunteer? I have never agreed that people should pay to be volunteer. If people come here on their own and want to volunteer, I can connect them with projects. Mary Overby is one person who taught English here at our new school called "Rocinha in English". 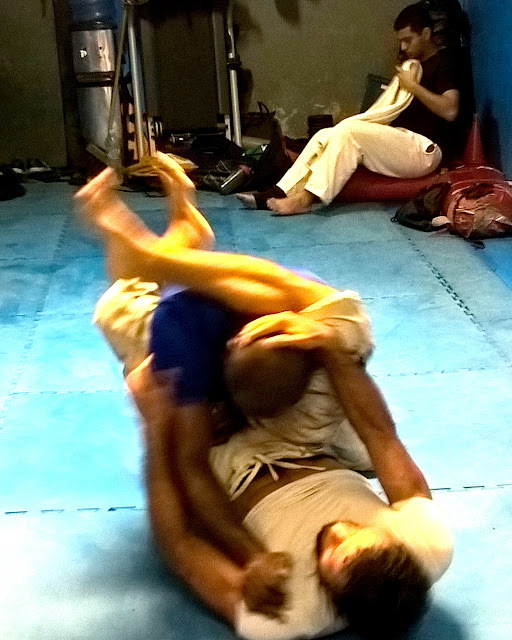 Tijl from Belgium, is another who came to volunteer at Barbara's Garagem das Letras and train jiu jitsu. Phoebe from the UK, came here for 2 months and taught children at a dance school. 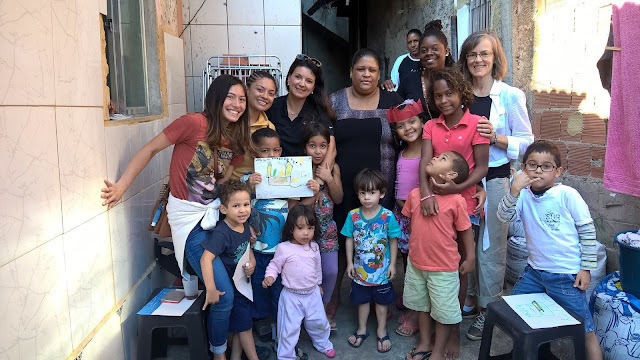 Dana Hernandez from Argentina has visited Rocinha about 4 times in the past 2 years and she always volunteers at the daycare that we partner with. All these people came, stayed in Rocinha and volunteered with projects that I connected them to, and never had to pay anything. It can be done if you have the right contacts and you do your research. Dana Hernandez from Argentina always volunteers at the same daycare. It is like a second home to her and the project loves when she comes to visit. She plans to move to Rio some day. You cannot just come here and expect everything will be free. You will need to pay the host family you stay with and your food, transportation etc. I don't know of any volunteer agencies even where you don't pay, other than the Peace Corps. But private volunteer companies will charge you and charge you a lot of money. The problem is you don't know where that money goes. If these companies were more clear on the percentages of the payment fee and what they cover, it would cause less confusion. Unless they are 100% transparent and show you, you will never really know especially if only one person is control of their books. 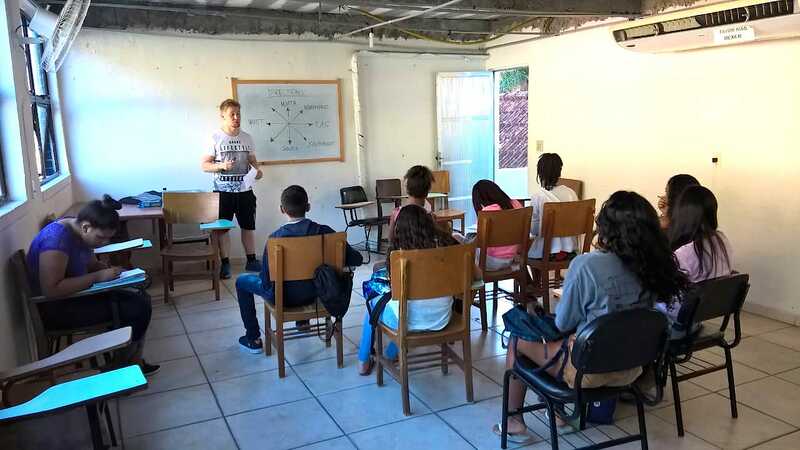 I knew people who volunteered with Iko Poran in Rocinha in 2013 and although they were promised Portuguese language classes, they never received them. Also the projects they worked at were not organized properly to receive volunteers. At times the volunteers were confused to what their responsibilities were when they arrived at the project. These people were from the UK where it's popular after high school to take a "gap year" and volunteer somewhere in the world. I met them in a restaurant here in Rocinha and they told me their stories. Now that I have started working with volunteers, I sometimes charge a service fee. This fee depends on what exactly I have to do for the volunteer that is coming here. How much time do I need to invest in the volunteer coming here. I am partnered with over 30 different (art, music, health, sports, children, environmental) projects that are open to receiving volunteers. I am known in the community and have a good reputation. These partners want me to attract volunteers to help their projects. Things I consider regarding the service charge. Do I have to set up everything for them (organize the volunteers work schedule and what they will be doing)? Do I need to bring them to the projects and introductions/translations? Do I need to meet them when they arrive in Rio and bring them to where they are staying? Do I need to show them around or give them a complete tour of the community? Do I need to be available at anytime to help them with whatever they need? E-mails, skype calls? What I earn as a service charge depends on exactly what I need to do and how much time I need to take off of my other job. I only get paid as a tour guide when I work. So, if I am not making a tour, I don't earn anything. Yet, I still need to pay rent, pay bills, food etc. Work has value and everyone has the right to earn a just salary. Not every volunteer do I charge this service fee. It's not necessary as most of the volunteers I have helped usually have a place to stay, speak some Portuguese and are independent enough that once I give them the contact of the project, they can do the rest. As a said, I'm not a volunteer company. Volunteers do give value to the projects and the community appreciates the help. For volunteers, first objective for the volunteer is to feel they are contributing to a worthwhile project. They want to feel their work has value. The second is to make sure they are in a safe environment. These are the MOST important things for people who come here. Connecting with the right people can help volunteers do this. I am just one person here and when people contact me, I don't have help to do this. There are others in the community who are creating experiences for visitors who want to help in some way. 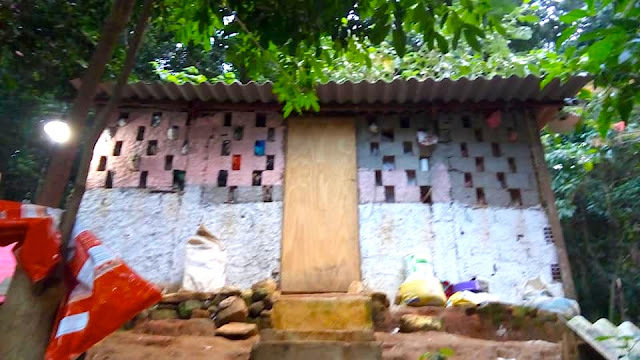 Other guides and community activists find their own projects to help based on need. Before volunteering, please do your research. Make sure your first contact for volunteering not only lives in the community but is invested in it as well. It's always awesome to receive people from other countries who want to experience Rocinha and contribute to projects that help the residents. I never imagined that I would be involved in this, but it happened kind of by accident. I have known "Nandy" for a long time. I have always used his services when I needed business cards or flyers done. Nandy is reliable and his work is good. About a year ago he approached me about English classes and I told him that it was difficult to organize and set this kind of thing up because you need a place that is like a classroom, books, and how is it to attract students. My thinking is that it would be too much work and I already was working with the dj school and animal shelter. There are a few other English schools here and I mentioned to one of them to contact Nandy to try to organize something but they never followed up. So, I felt I should at least give it a try. It's a challenge, but it's now going on. Thus..... "Rocinha in English" school was born. Finally in April of 2018, I finally decided to sit down and have a meeting with Nandy, Heberson and Vinicius, the main people wanting to help organize this. Nandy is connected to the "First Baptist Church of Rocinha". They offered a classroom and we set up everything up to get the classes off the ground. Nandy and Vinicius created this project called "Nasceer" which under this name there are several projects. 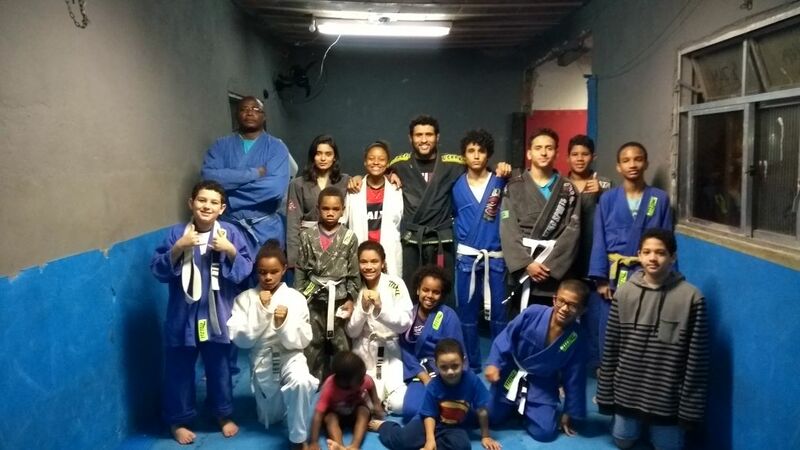 Some of them are "Reforca Escolar" (Home Work Club), Jiu Jitsu, Muay Thai and the "Rocinha in English" Classes. My job with Nasceer is as Executive Director of Communications. I promote their projects to locals and also try to attract potential volunteers that would like to help or create unique classes that can enhance the cultural experience between people of different countries. 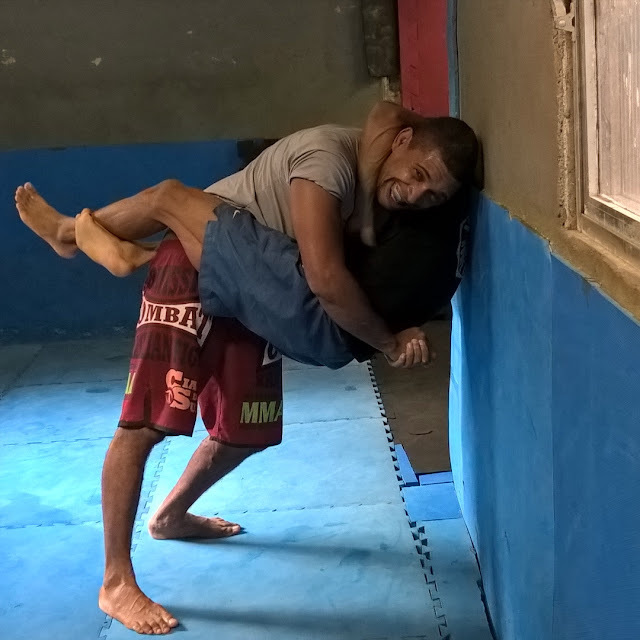 My focus initially was getting the "Rocinha in English" classes off the ground. Being that I have been involved in Brazilian Jiu Jitsu since 1996 it was only natural that I would also gravitate towards helping them too. There are many kids that need Jiu Jitsu uniforms, so I am working on a project to get kids uniforms through fundraising and donations. I will help in any way that is possible. I also started a facebook page called "Rocinha in English" to attract more locals to participate. For those that want to create a new project, I am the first contact. Nandy is the administrator who signs people up for the classes and facilitates the space(s) where project(s) will take place. Nandy and I work together to ensure that everything is done correctly. It's awesome to finally work with another person who is serious about this kind of work. And another person who follows through. We are a good pair. 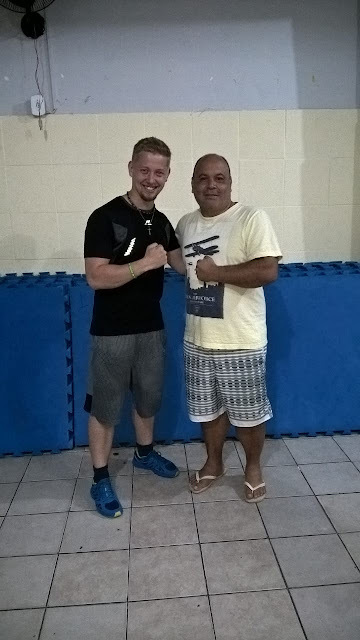 Otto Munter from Finland, had contacted me some months before arriving in Rio and asked about volunteering and I gave him an idea of how he could help. I organized everything from meeting him, bringing him to the guesthouse and projects. I found him housing in a nice area of the favela and he took two tours of the community so he could be comfortable and independent. He was only here for 1 month which goes by very fast. The students enjoyed his teaching and now all I hear is how much they miss him. We hope he can return someday. 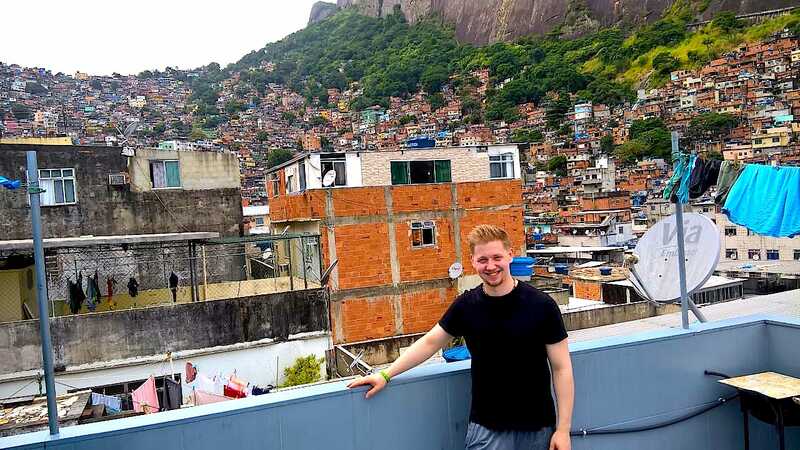 I asked Otto to write something about his experience in Rocinha as it is important for us to show that yes, you can come here and make a difference of the lives of people here. 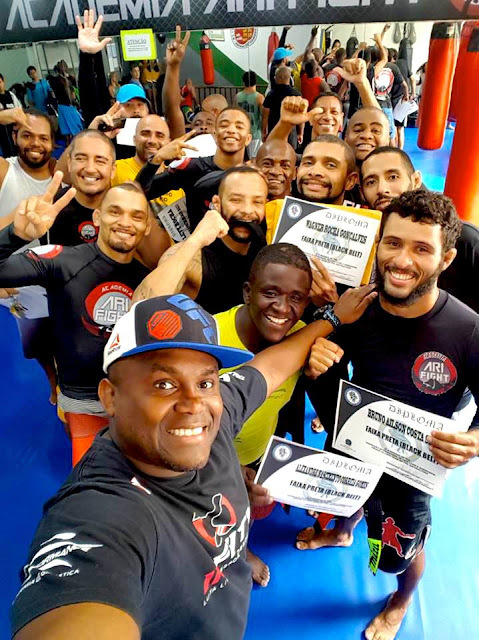 Rocinha wants to thank people like Otto and any other volunteers that come here and sacrifice their time to enrich the lives of others! My name is Otto Munter. I come from Finland. The reason I wanted to visit Brazil at first was because I needed a long holiday far from Europe. Then I became aware of the situation of favela people in Rio de Janeiro and I felt like I want to help any community there the best I can. I watched many documentaries in youtube about favelas and there I found out about Rocinha. I watched videos about Rocinha and thought it could be place for me. I also found a blog in the internet written by Zezinho who lives in Rocinha. We started sending messages and he promised to help me if I wanted to volunteer some projects in Rocinha. And after six months of working and getting enough money, I finally travelled to Rio. I found my way to Rocinha and got introduced to the project organizers. Otto after the English class with "Nandy" one of the project organizers. My project was teaching English. I was teaching two groups: young group and adult group. I taught the youth class from 3-4pm and the adults in the evening from 7-8pm. Both classes were only 1 hour long. 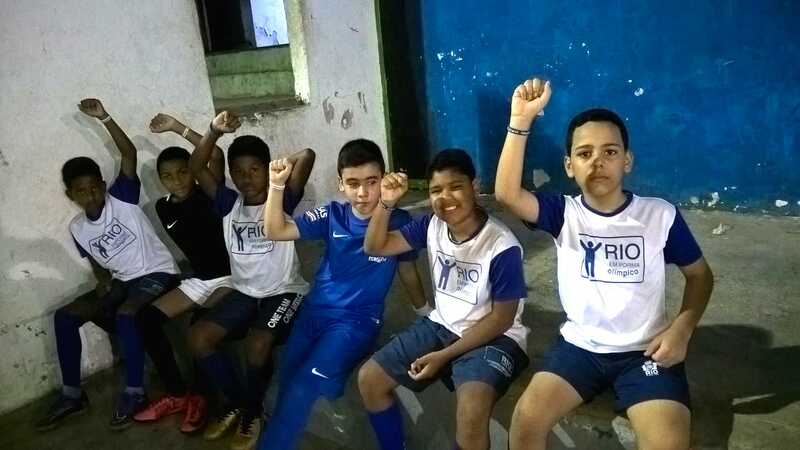 The reason I wanted to stay in Rocinha was because I really wanted to live inside the community since I was helping them and wanted to feel a stronger connection to community. I felt like I didn't need any luxury hotels or anything like that. I stayed in a very nice guest house in Rocinha. I like many things about Rocinha. The people there are very kind and seem happy. Everyone was very friendly. I also like that Rocinha actually never sleeps. There seems to be action through every night and day. I really like the buildings and architecture in favela. I've never seen anything like that. Many buildings seemed like very fragile but they were still firm. What I don't like about Rocinha were the shootings. Fortunately there were not many shootings when I was there. Mostly people were firing fireworks. Actually I didn't like that either since sometimes it was hard to get sleep while there were fireworks going on outside. But better fireworks than shootings for sure. My overall experience in Rocinha and in Rio was amazing. I really liked teaching english and seeing how my students developed their english skills. What i would change about Rocinha are of course minimizing the shootings to zero. Actually there are not many other things I would change. I like how differently things are organized compared to Finland and other western countries. I wouldn't change other things because everything reflects local culture which I like. I recommend volunteering to Rocinha for anyone who is interested about helping other people. Zezinho is a great guy and he can arrange all sorts of volunteer work for anyone who wants to take part to the projects. I wasn't afraid of the shooting because they happened pretty far away from where I was staying. And Zezinho advised me very well about the no-go areas. I wish I could return to Rocinha and this time with my wife. I think it's more likely. I would like the world to know that favelas in Rio aren't how they are portrayed in Western media. Before I visited Rio, my image about favelas was very violent. I thought they were full of criminals who terrorize the community. After spending a month in the favela my mind has changed. I found happiness and kindness there. Something that's hard to find even in Finland and Western countries. There were some bad things going on of course but the things I encountered in Rocinha were mostly positive. I first met Bruno Silva when he was training at AriFight, which is a very small Martial Arts school located at the top of Rocinha. 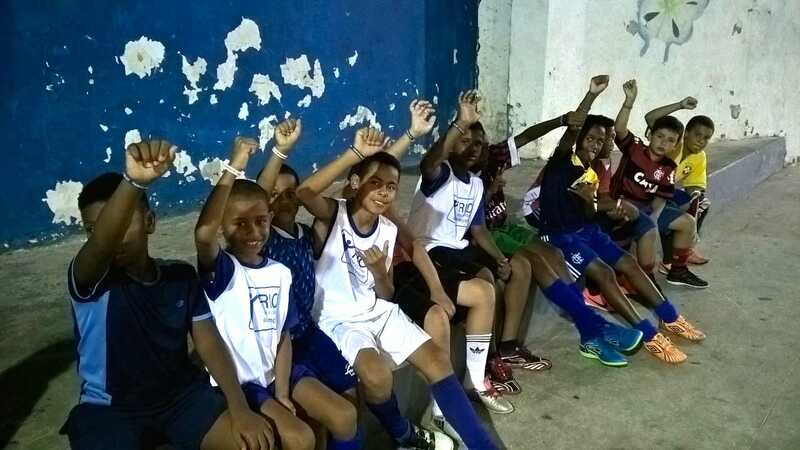 The school was started by Aritano Barbosa who also has a school in Botafogo. 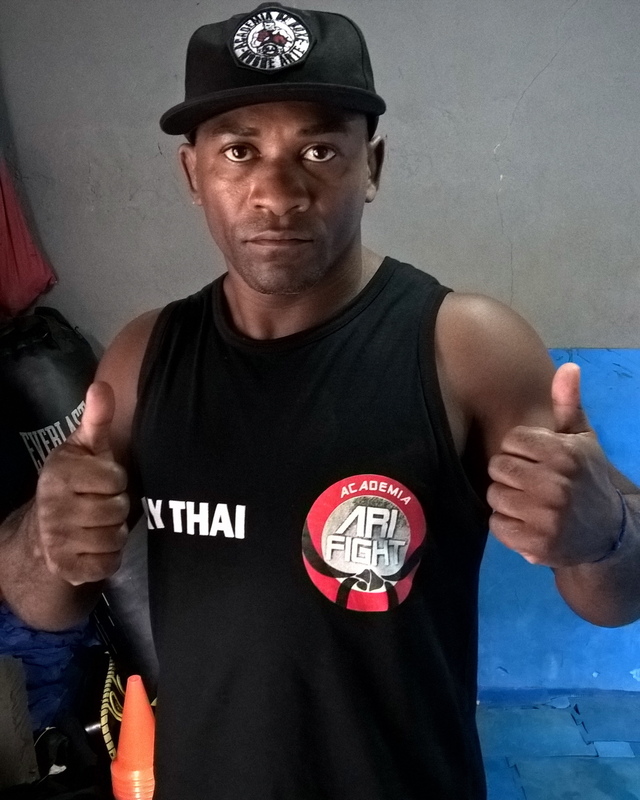 The school in Rocinha is overseen by "Ari" but is run by Alexandre Gomes and Bruno is now teaching there. 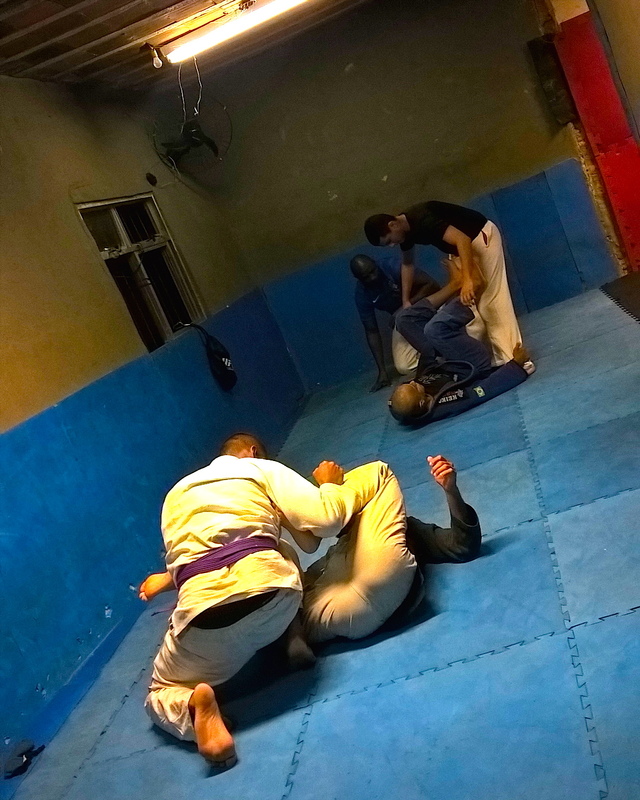 The school provides Jiu Jitsu and Muay Thai classes for adults and youth and children. I visited the project about 8 months ago and took these photos of the adults training Gi and No Gi Jiu Jitsu. 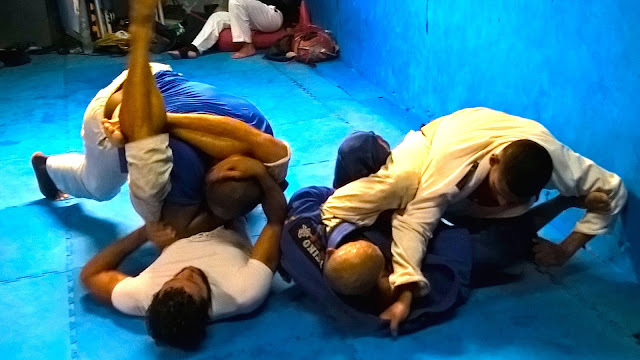 When observing class, I noticed this one guy who was a brown belt dominating many of the students. I ended up talking with him after class and he gave me the information about the school. I also got info from Alexandre Gomes too. I found out that Bruno competes in No Gi Jiu Jitsu. In Brazil they have a separate sport called Luta Livre which was started by Hugo Duarte who had a falling out with the Gracie's. 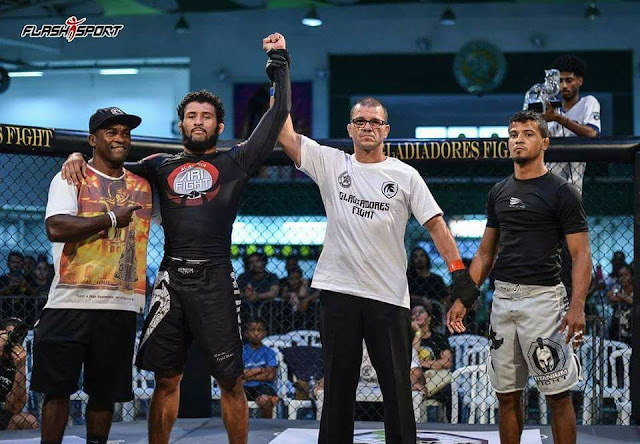 Hugo was a specialist in Luta Livre or No Gi Jiu Jitsu and decided to start his own Sport. I made friends with Bruno on Facebook and started following his career. I noticed he was competing a lot and always placing in the tournaments. Many of them he was winning. As our tours get more popular I want to be able to help athletes who need it. We can help by purchasing equipment, entry fees into competition or other things they need to compete. 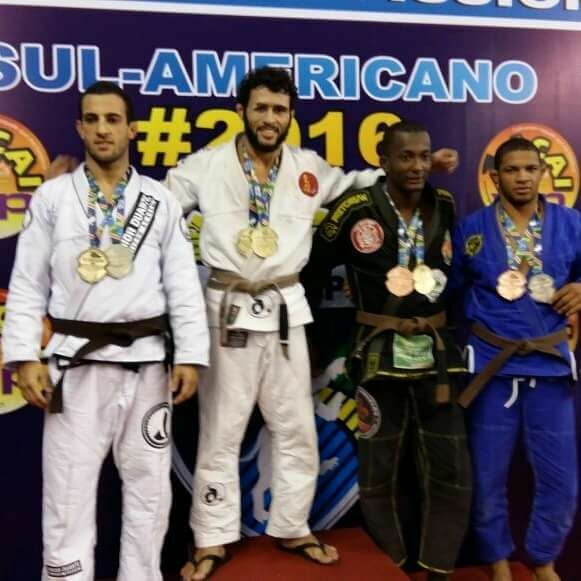 With Jiu Jitsu players I thought about helping by getting Gi's. 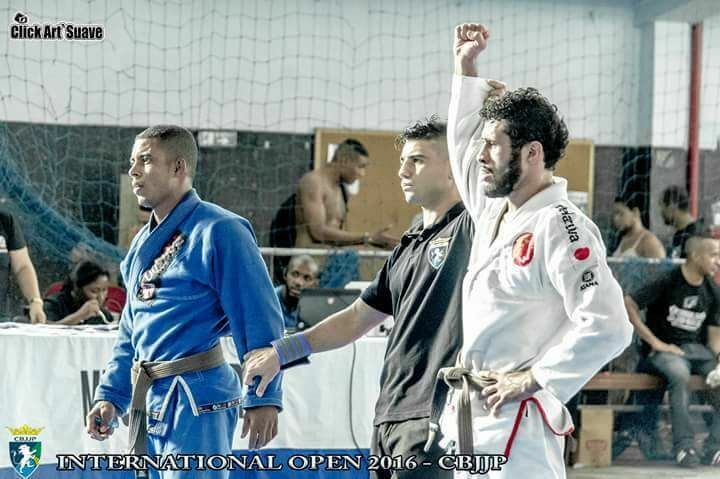 In Rio Gi's can be expensive costing from 200-400 reais for these uniforms. For many in favelas, this is half a monthly salary. I thought about ways I could help Bruno as I was impressed with how disciplined he was with his training and competitions. So, the idea of getting him a good quality Gi came to me. I had these guests come to visit. 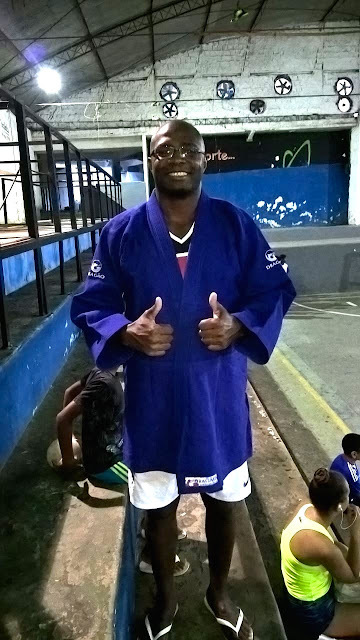 Darren Tinsley and his wife took a tour, but Darren also had the opportunity to train some Jiu Jitsu in Rocinha. 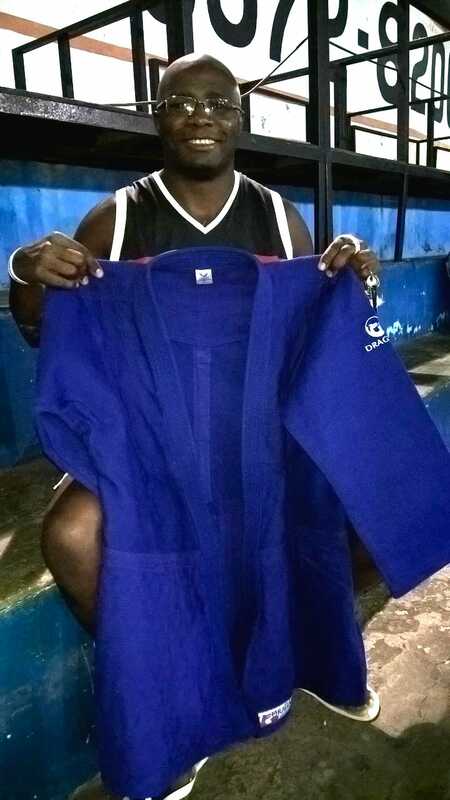 I used some of the money from that tour and was able to buy a Gi for Bruno. I never told Bruno my plans as it was going to be a surprise. 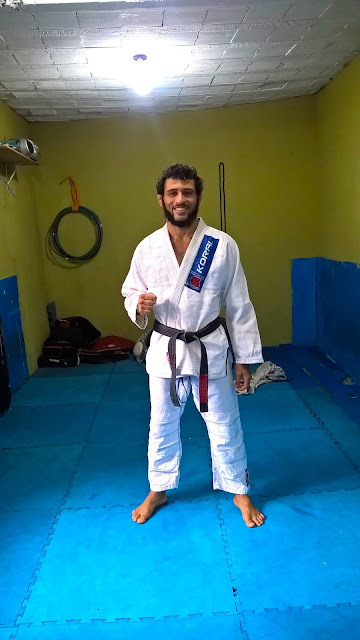 Bruno wearing his new Koral Gi, thank you to visitors who support our work. I contacted Bruno and found out his schedule and I wanted to get a little more background about him. We organized a time to meet and this was Saturday (two days ago). So, I gave a little interview with him. Bruno where do you live? I live in Rocinha in a area called 99 with my wife and two boys aged 2 and 4. I am 29 years old and have lived in Rocinha for about 20 years. Yes, I work at a private school called PUC in Gavea which is very close to Rocinha. About 10 minutes by bus. I work as a chemistry technician. 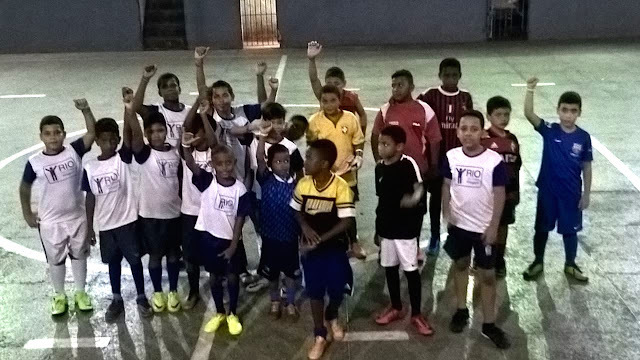 I also help teach at Instituto Reacao which is in the Sports Complex at the bottom of Rocinha. When did you start Martial Arts? 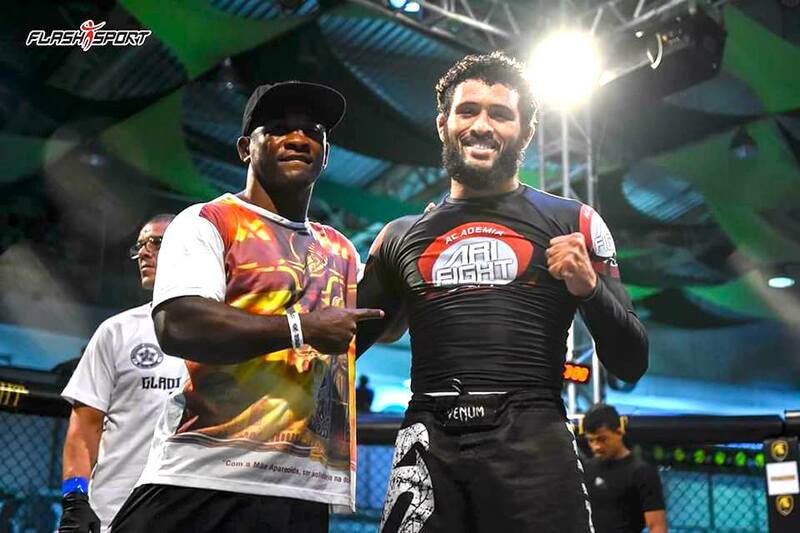 I started Luta Livre when I was 14 training under Mestre Aritano Barbosa. I also started Jiu Jitsu at 15, a year later but then stopped because I enjoyed Luta Livre more. 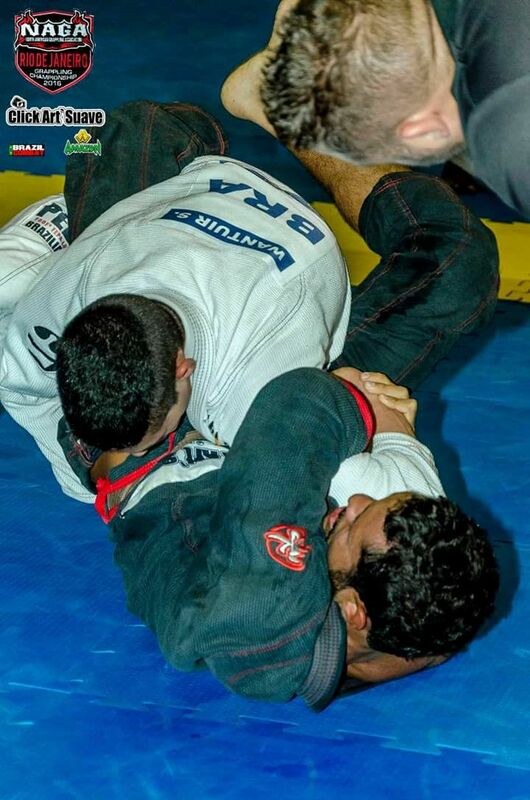 But when I was 23 years old, I returned to Jiu Jitsu training under Marcos Antonio "Marquinhos" and Paulo Caruso. 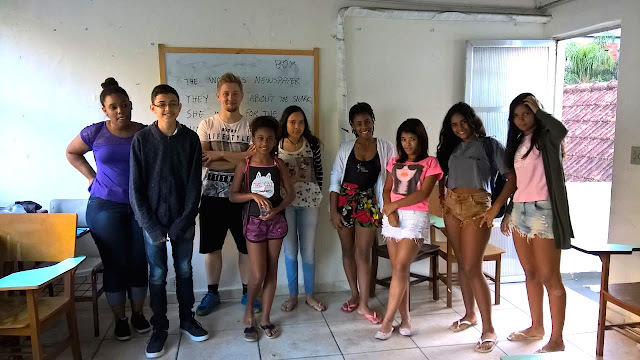 Aritano decided to open this small school in Rocinha which I now teach at with the other instructors. Our school needs help as it is very small yet there is big demand for adults and kids that want to train but we don't have the space. I have always trained but I think it can change your life when you are involved in any kind of activity, especially sports. Without sport/training, my life would be incomplete. Also I remember watching on television this fight between Bob Sapp and Minotauro Nogueira in Pride Fighting Organization. After watching this fight on television, this inspired me to enter into this sport. 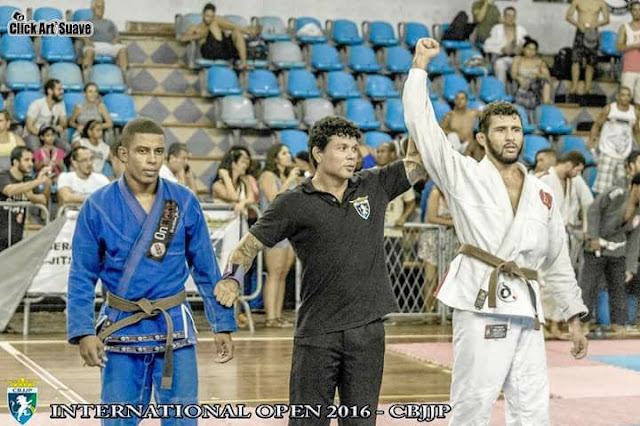 Minotauro of course and my instructors Aritano, Maquinhos and Paulo. 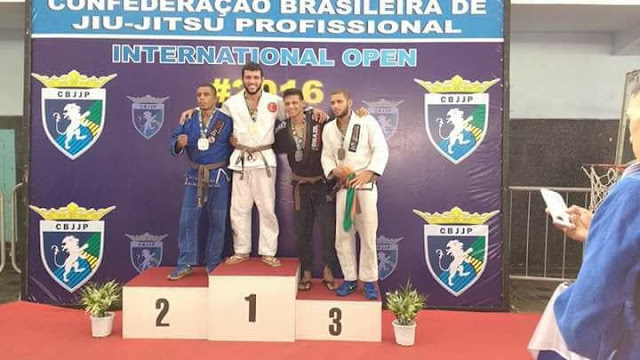 I would like to see my children involved in Jiu Jitsu or some sport and watch them compete. 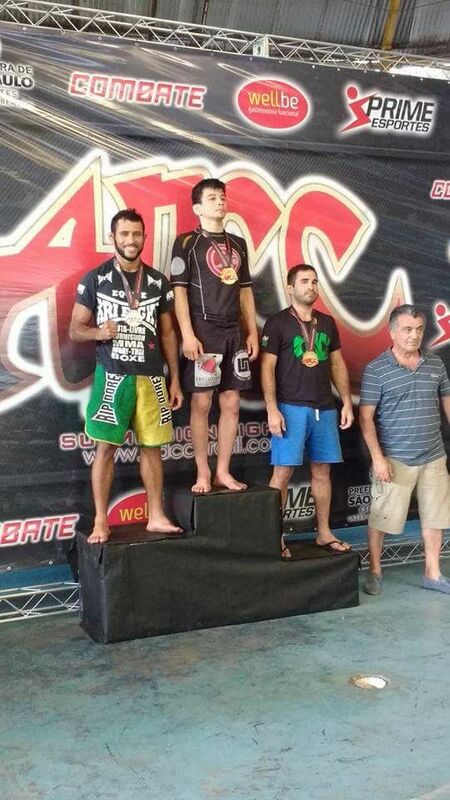 My personal goal is to someday compete in the ADCC No Gi World Championships. Bruno with Alexandre Gomes (in the yellow shirt) receiving their Black Belts November 2017. 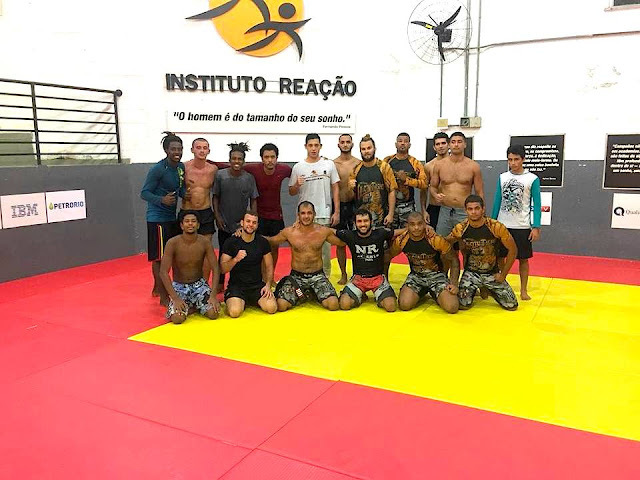 Below are some photos that Bruno sent me of his No Gi (Luta Livre) competitions. 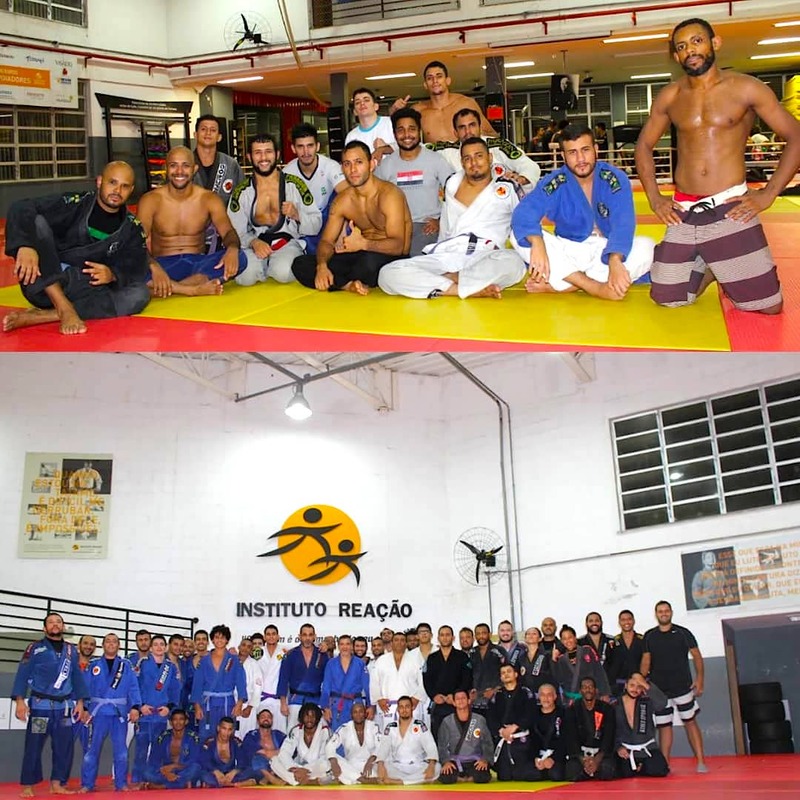 The photos below are the of the Instituto Reacao where he also teaches in the evenings after work. 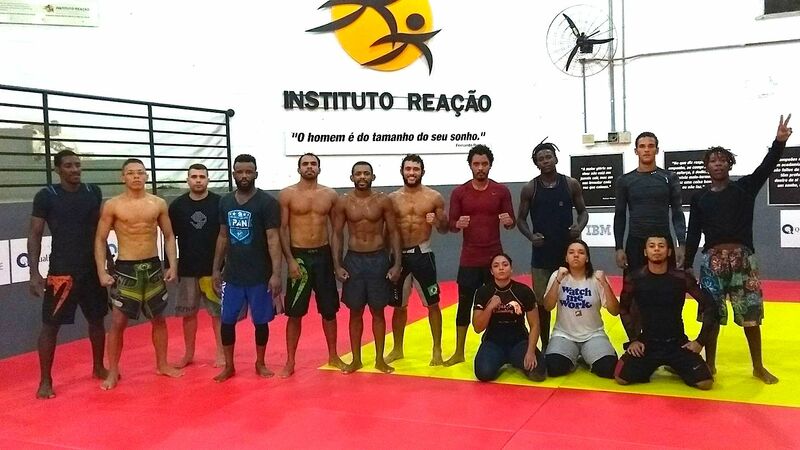 Every Friday is No Gi day. Otherwise the Jiu Jitsu classes require you wear a uniform (Gi). 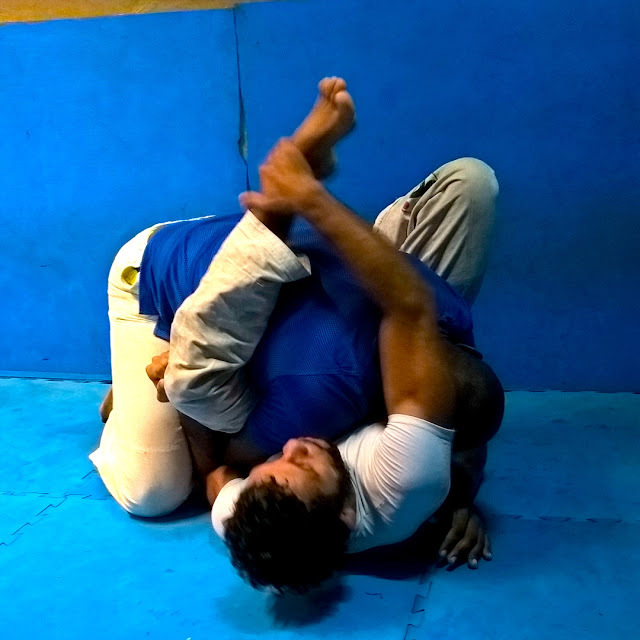 These classes are free of charge for anyone that lives in Rocinha. 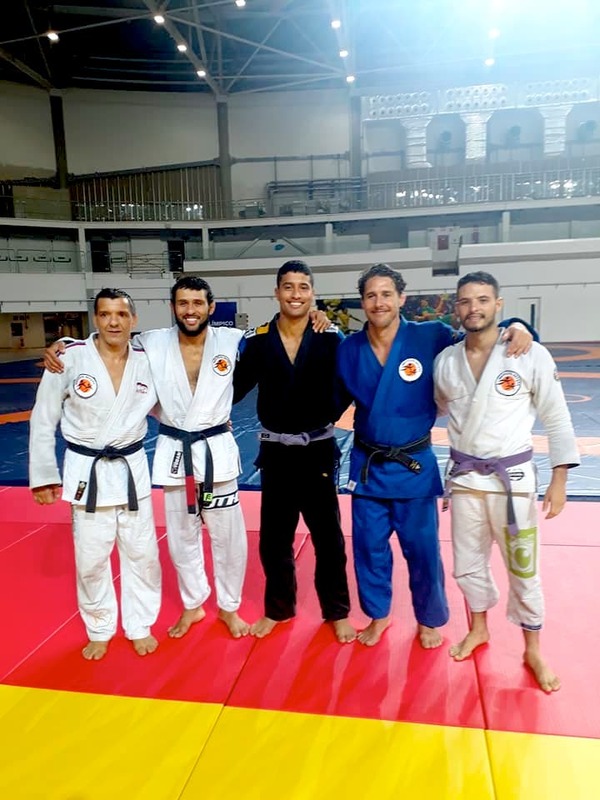 Bruno is second to the left and in the Blue Gi is Judoka Flavio Canto the man who created Instituto Reacao and he won a bronze medal in the 2004 Olympic Games in Athens Greece. 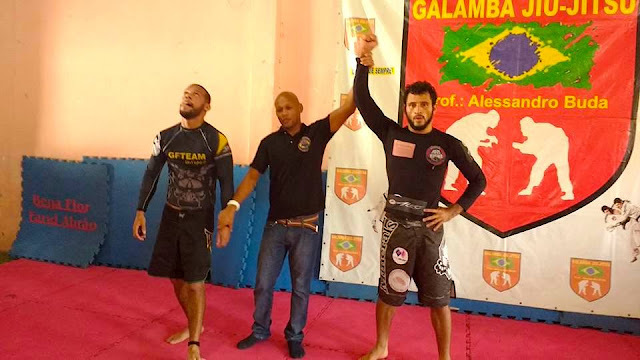 His projects exist in several favelas including City of God which is the home of Gold Medalist Rafaela Silva from the 2016 Olympic Games in Rio de Janeiro. 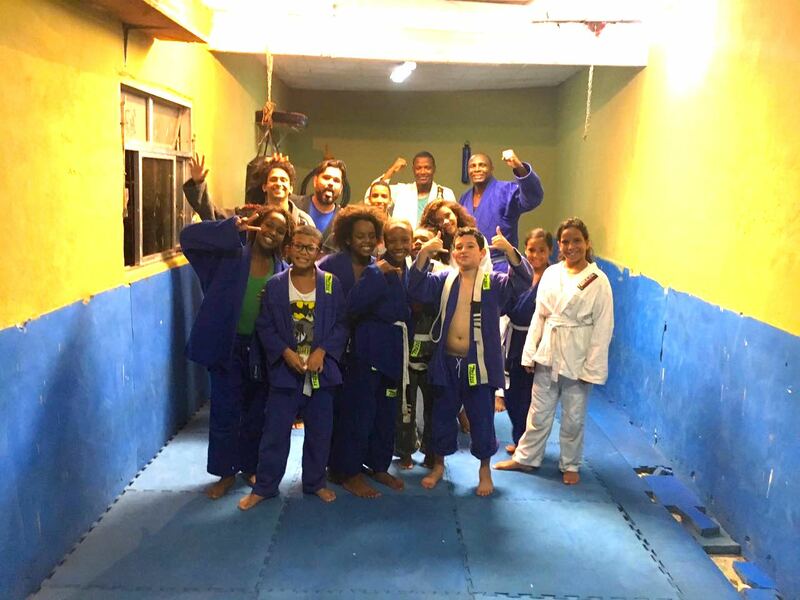 And of course some photos of the Quadra Rua 1 in Rocinha where Bruno teaches with a group photo with kids and a few adults. In the back row is Waldney wearing his new Blue Gi. He teaches there every Saturday from 10am until 12 noon. Depending on his schedule during the week, he is also there. If you are interested helping with the project or sponsoring Bruno, please contact us. Bruno also teaches private lessons. AriFight school in Rocinha has an open door policy and anyone is allowed to train here, so visitors are welcome. I have been more focused on improving my health and losing weight than contributing to the blog lately. I need to start writing more. In March of this year, I went up to Andre's project Crianca do Futuro to drop off some donations that I had here in the house. I brought some wristbands which everybody loves and wants. Everyday when walking in the community at least 10 times I get asked for wristbands. I have run out so I need to get more of them. The younger kids (kids aged 8-13) play on Tuesdays and Thursdays from 5-8:30pm so I decided it would be a good idea to bring a bunch and hand them out. I have been visiting Andre's project for a few years and noticed a big guy sitting there cheering on his son. 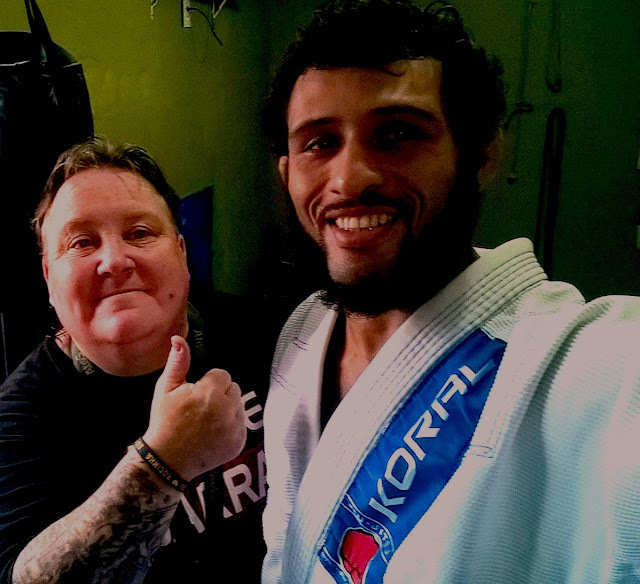 I recognized him from the Jiu Jitsu project that they have in the back of this building. When he was training I noticed that he didn't have a Gi top. I know that he is a big guy at (6'2 100 kilos) and it's not easy to find sizes that fit bigger people. I asked him what size he was and he said A4. So, I kept this in mind for this visit. When I returned on this day, he was there. I brought the A4 blue Gi top. His name is Waldney and I gave him the Gi top. He was so happy. After talking with Waldney I noticed he was cheering on his son Davi. 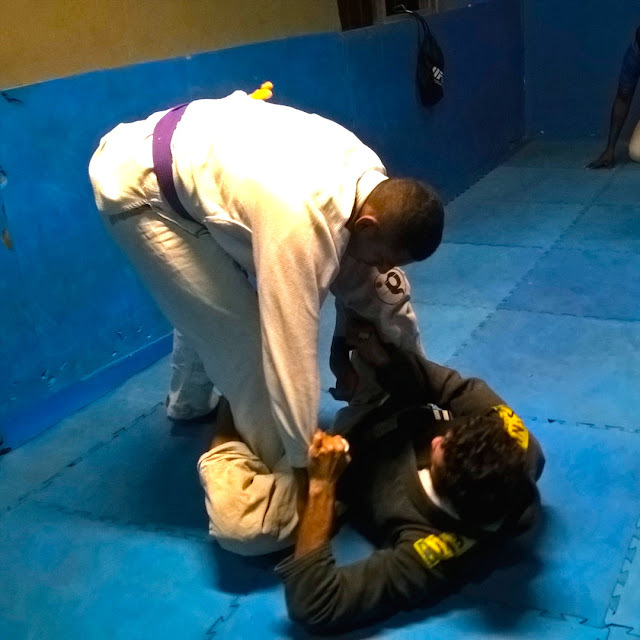 Davi is 9 years old and loves Football but Waldney keeps his son active in Jiu Jitsu and Capoeira as well. I had a small Football jersey that I was looking to give to someone and it fit Davi perfectly. Football is like religion here and even the girls/women take part. Vitor Alexandre is the head coach of the girls team and unfortunately they don't get as much help or sponsorships as the boy's teams get. 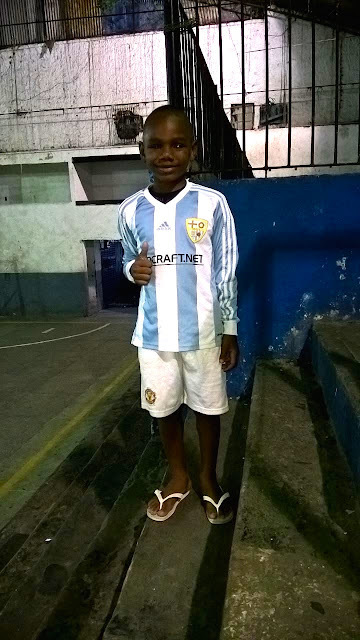 I had received a pair of football shoes from one of the tourists that had visited Rocinha in December of 2017. I wanted to make sure that they were given to a girl who was in need. Vitor told me aboutRafaela Silva who plays both field and futsal (indoor football). 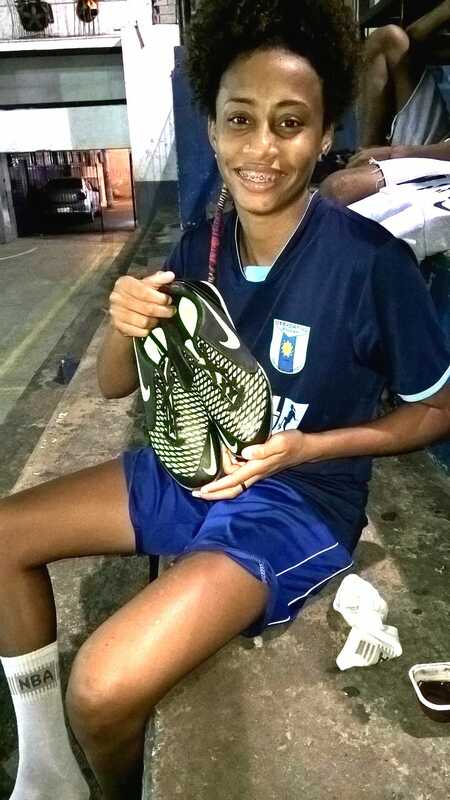 She was so happy to receive these brand new football shoes. I want to thank all those visitors that makes this work possible and enjoyable. We will always be helping people in Rocinha in any way that we can. Tourism making a difference for the local people. simple guy who is enjoying life. I enjoy sharing my life in the favela and other happenings here in Rocinha.